Derrick is the longest-serving member of the BioImaging Facility having started his position in the spring of 2003. 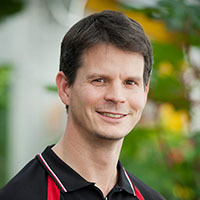 His diverse background in engineering (le College Militaire Royal du Canada in St Jean sur Richelieu, Quebec), anatomy and physiology (Dalhousie University in Halifax, Nova Scotia), education (University of Victoria in BC), medical laboratory science and experimental medicine (UBC) is a great asset for the training and research/technical services we offer. Derrick’s major focus in the BIF is the use and development of preparation and imaging techniques for Scanning Electron Microscopy, including cryo-SEM. Derrick has been a practitioner of Transmission Electron Microscopy for 20 years and is a member of the Microscopical Society of Canada.